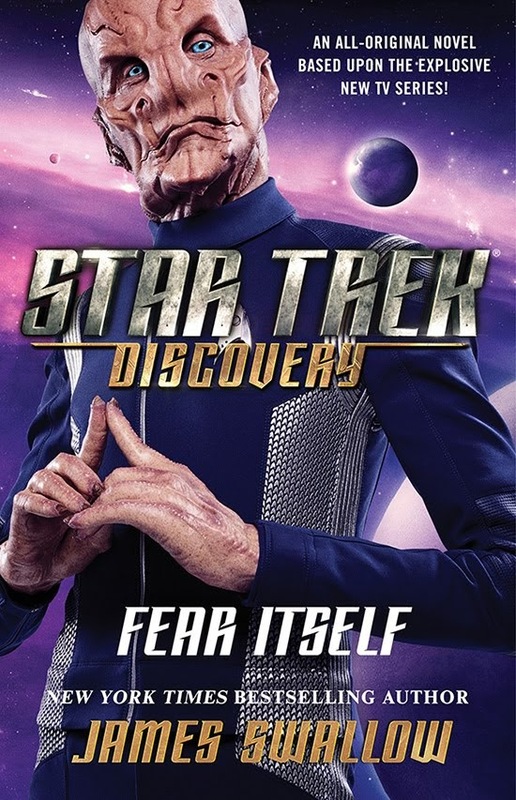 The third Star Trek: Discovery novel, James Swallow's Fear Itself, is due in June, and now StarTrek.com have revealed the cover, which of course features Saru, who is at the center of this latest tale, set aboard the USS Shenzhou prior to the TV series. You may notice this is a different design to the audiobook cover I posted recently; that cover has now vanished from official listings, so I guess it was just a stand-in. Lieutenant Saru is a Kelpien, a member of a prey species born on a world overrun by monstrous predators…and a being who very intimately understands the nature of fear. Challenged on all sides, he is determined to surpass his origins and succeed as a Starfleet officer aboard the U.S.S. Shenzhou. But when Saru breaks protocol in order to prove himself to his crewmates, what begins as a vital rescue mission to save a vessel in distress soon escalates out of control. Forced into a command role he may not be ready for, Saru is caught between his duty and the conflicting agendas of two antagonistic alien races. To survive, he will need to seek a path of peace against all odds, and risk compromising the very ideals he has sworn to uphold…. This is the third Discovery novel so far, all of which have been prequels, with David Mack's Desperate Hours also featuring the USS Shenzhou crew. You can also find series reading lists and author bibliographies on my dedicated Star Trek lists site, including listings of the Discovery novels, and James Swallow's other Star Trek works. To keep track of all the latest novel releases, hit the prose or books buttons on my 2018 schedule page.